White Vinyl Railing adds charm and character to any deck, patio or porch without all the maintenance hassles of painted wood. 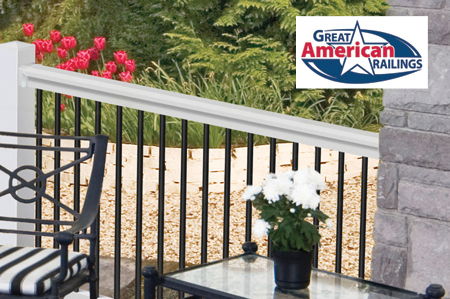 All of Great American Railings are always made of the finest materials. The Railings have a freshly painted look. The panels are available in 2 different widths: 6' or 8'. Our Radiant Guard color retention technology protects the finish from the sun's harmful rays. Copyright 2017 All rights reserved. Site designed and hosted by Mango Bay Internet.